Style professionals say that every woman should have a black dress, a pair of nice jeans and the perfect trench in her wardrobe. Of course, the same principle applies for your makeup products and there are some makeup products that every woman should have in her bag. 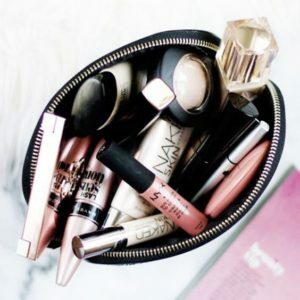 Having a huge makeup collection is great, but what every woman really should have are the perfect cosmetic basics – the all-around and crucial beauty products that you can use every day. So if you have ever asked yourself „What beauty products should I have in my bag“ here is your answer. These are 10, makeup products that every woman should have in her makeup bag. You should think of these as the Black Dresses of beauty products. Here is the list of ten beauty basics you need to look fabulous, regardless of the occasion. You can wear red lipstick at any age and time of the day. If you have the right shade in your bag, you will always have a fallback appearance you can pull together in a couple of minutes. One of our favourite drugstore lipsticks is CoverGirl Lip Perfection Lip Color in Hot. And there is a reason why people consider MAC Lipstick in Ruby Woo a classic. The authentic red shade suits almost all skin tones. If you want to achieve smoky eye in just two minutes you should choose an eye shadow palette with at least 3 colors – a pale, shimmery shade to accentuate the internal corners and center of the eyelid, a medium shade to wash over the eyelid and a dark shade to create depth in the socket and along the eyelash line. Professionals recommend Chanel Quadra Eye Shadow in Premier Regard with 4 smooth-wearing powder shades in one luxurious small package or NYX Cosmetics The Natural Eyeshadow Palette features six wearable shades. Every beautiful makeup look requires a foundation, but this doesn’t mean that you have to apply one. For most skin tones, semi-sheer tints provide just the right amount of coverage and allow your glow shine through. You should opt for a product that contains SPF, like Shiseido Urban Environment Tinted UV Protector SPF43 or Clinique Moisture Surge CC Cream Hydrating Colour Corrector Broad Spectrum SPF 30. Optional: If shine is a problem, you should use a translucent setting powder. It doesn’t matter if you prefer to play up your eyes or your lips, a pop of vibrant color is like a momentary makeover for your appearance. You can take an all-black clothing to the next level with bright pink lips or bold blue eyelids. You should use Givenchy Le Rouge in Fuchsia Irrésistible because it is as hot pink as it can be and it comes in a luxurious leather case. Professionals also recommend Maybelline Eye Studio Color Tattoo Metal 24H Cream Gel Shadow because it has a colorful foil effect which lasts for a long time. If you are not using a stick concealer, it’s high time to start using it. No other kind can hide dark circles under your eyes or blemishes as thoroughly as these can. You can apply them using a flat, skinny brush or your fingers. Experts recommend Hourglass Hidden Corrective Concealer or L’Oréal Paris True Match Super-Blendable Crayon Concealer. CK One Color Shine Lipstick in Frenzy because it is a shiny sheer pink which is universally flattering. Women adore a bright blush, but a neutral shade which will not mismatch with your clothing or your lipstick is something that every woman should have in her bag. Try Nars Cream Blush in Penny Lane because it will give you an instant glow and help you to chisel your bone structure. You can replace a bronzer also, provided it is matte. Professionals recommend Laura Geller Baked imPRESSions Bronzer. It is a super silky powder and with it comes a nice little kabuki brush. When you want to achieve a more dramatic look, liquid or gel liner is the only thing that you can use. You should use these inky products to create a cat eye, or dot them between your upper eyelashes to create a fuller look. You can use inexpensive products, such as E.L.F. Essential Liquid Eyeliner but if you are right-minded you will choose a chocolate brown and not black, like Bobbi Brown Cosmetics Long-Wear Gel Eyeliner in Espresso Ink. Every woman knows what difference a couple of swipes of mascara can make. If you want the best results you should opt for a mascara whose wand has bristles that multitask, such as the dual-sided brush in Lancôme Hypnôse Star Mascara. You should also try Revlon PhotoReady 3D Volume Mascara because with it comes a clump-busting plastic brush with a spiky tip which grabs small corner eyelashes. Although the results are pretty subtle, you shouldn’t skip this makeup product. Well-placed highlights can make big difference between ordinary and stunning. For an instant boost you should use a luminizing powder or pen to swipe over the tops of your cheekbones, in the folds around your nose and mouth, the Cupid’s bow of your upper lip and the corners of your eyes. Instead of over the top sparkles, you should choose a highlighter with a subtle sheen. Laura Mercier Matte Radiance Baked Powder Compact and Yves Saint Laurent Touche Eclat both do the job.